The World's Fastest Food Game! 2 to 4 players race to play all of their cards. Quickly try to match the shape, count or food category. A fast, portable, easy and “fun for everyone” game. In this lightning-fast card game, 2 to 4 players race to be the first to play all of their cards. Using sharp eyes and fast hands, players quickly try to match the shape, count or food category. The first player out of cards wins. A fast, portable, easy and "fun for everyone" game. 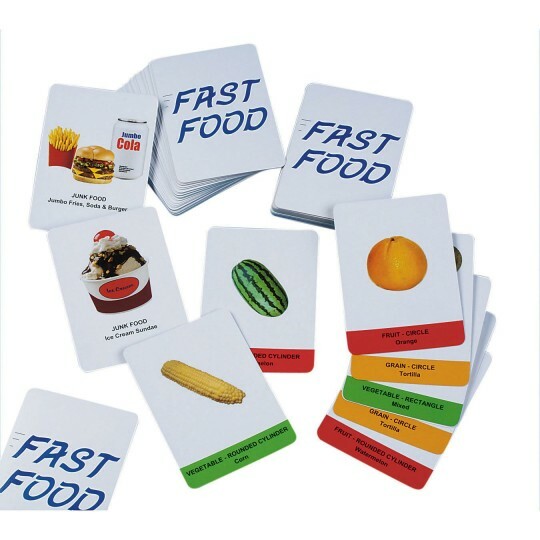 Includes 80 game cards depicting foods from the Food Pyramid categories, 4 special action cards and instructions. Great for people who like UNO® or Blink®.